In last week’s post, I broke down the basics of the Fedora offense. The two buzzwords about the Fed Spread, as I’m calling it, are “matchups” and “spacing.” In short, by spreading the field with skill players, the defense is forced to tip its hand before the snap or risk giving up a big play; unless the defense goes to a nickel or dime package, there is then a resultant mismatch pairing a slower linebacker on a faster wide receiver. If the defense goes small, then the run game can dominate. Now, the spread offense depends on a few things to succeed, the first of which is space. A common struggle of a typical spread offense is that scoring tends to drop off in the red zone, more so than conventional offenses accustomed to operating in a short space anyway. Because the field is much shorter inside the opponent’s 20 yard line, the defense is able to hide its intentions a bit better, since it has less space to cover when making up for lost ground. Spacing becomes less of an advantage as the goal line gets closer, because the vertical game becomes progressively less of a threat. Even the primary goal of the spread, to create mismatches, becomes less attainable since even an out-of-position safety can usually recover on a short field – even Houston’s #24, who had a bad game for the ages against Southern Miss. Hehe. The screenshot evidence this week is both lacking and of poor quality; for that, blame both the difficulty in ferreting out hard-to-find online video of Conference USA games (go ahead, you try, and highlight YouTube videos don’t count) and the awful video quality of the one USM game I could find on ESPN3, their September 24 contest with Virginia. Southern Miss won the game 30-24, but only scored one touchdown in the red zone. I told you the quality sucked. USM is represented by the smudges in white; the Cavaliers are the nondescript blobs in what I think is navy. Austin Davis, the Southern Miss QB, is about to take the snap in an extremely typical spread formation (and hey, I didn’t call him Anthony Davis this time!). He’s going to read the playside linebacker, circled in red, but he also has to contend with the safety, who’s off the screen standing on the ten yard line. 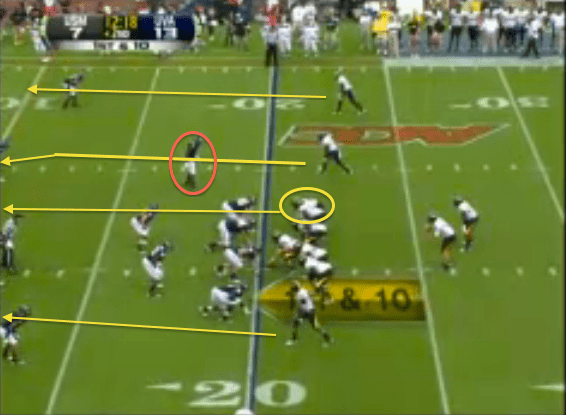 You can sort of see a smudge of him, right at the point where the #2 WR’s arrow ends. More on him in a second. The linebacker is matched up in what looks like 1-on-1 coverage against an athletic tight end. Mismatch.